StoreFront is the best choice for site owners that value their customer’s time. Every feature is built for speed and flexibility to maximize sales and get eyes on your products, and responsive design makes sure that your customers have full access to your site's features no matter whether they're on a desktop, tablet or mobile phone. 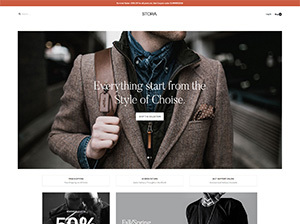 A pleasure to look at but cleanly designed to keep everything clear for your visitors, with CSS3-based animations for that extra visual sheen, this webshop theme for Joomla takes advantage of the superior feature list of both our News Show Pro and Tabs extensions by combining their features. Multiple rows of your best-sellers are on display, and you can group them by category to allow customers to switch instantly between them. With Image Show providing the initial impression with a large full-width slideshow in the header that can have slides added to it in seconds, users are then immediately able to view your latest products. A parallax-scrolling background serves as the backdrop for a testimonial, and blog posts get their own section to bring visitors further into your site. On the sales side of things, we’ve got support for VirtueMart to give you the flexibility to manage your inventory without fuss, and with HikaShop support you’ll have a solution that takes advantage of the latest version of Joomla too! Make your e-store something special today.